Exactly one month later to the day, at least two more businesses along Wealthy Street were vandalized. 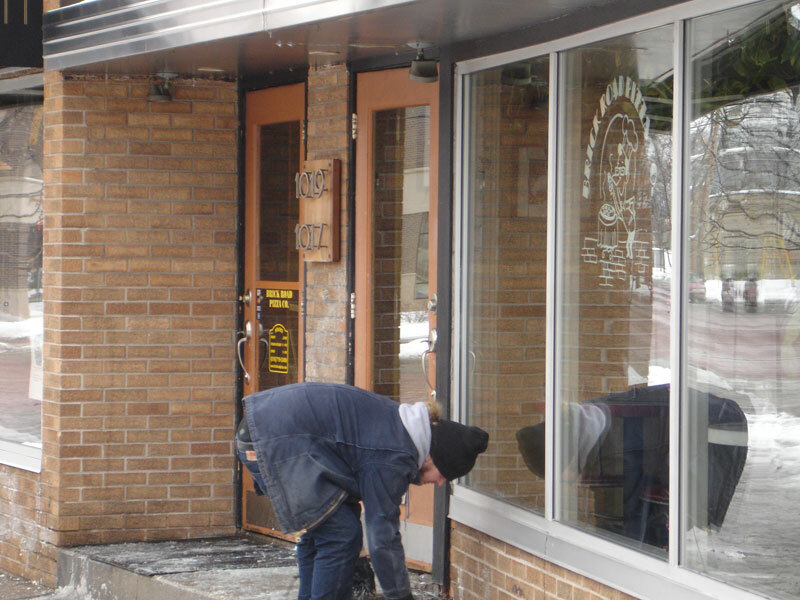 Both Brick Road Pizza Co. (1017 Wealthy St.) and the Electric Cheetah (1015 Wealthy St.) had windows smashed out at approximately 4:30 a.m. this morning. A note was left by the culprits reminding the business owners of the fateful anniversary and warning of future vandalism. 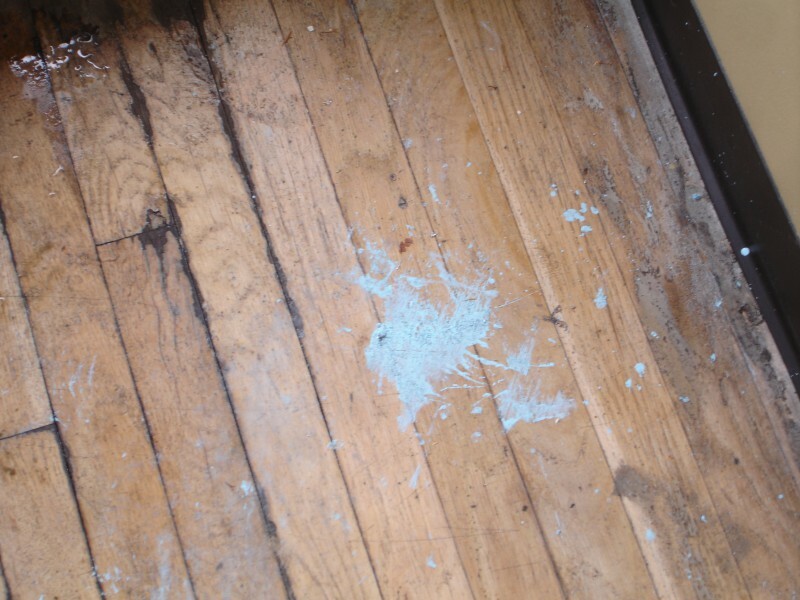 According to Jody Talbert, co-owner of Brickroad Pizza Co., bricks bearing the familiar circle-A anarchy symbol were thrown through the glass of both of the establishments' front doors, and paint was thrown around the building's facade. While some blue paint got inside the restaurant, it does not appear as if it was thrown in. The same symbol was spray painted on the building. Along with similar damage at Electric Cheetah, the so-called “brick throwers” got on the roof of the building and spray painted the words “REFUSE, RESIST, RECLAIM” along the top of its facade. The necessary repairs were made to both buildings by 10 in the morning. Brick Road Pizza will be open today at 11 o’clock, as planned. If you have any infomation about these incidents, you can call the Grand Rapids Police Department at (616) 456-3400 or call Silent Observer anomyously at (616) 774-1234.
not sure exactly what the brickthrowers think they're going to accomplish here, but it's clearly not working (and not going to work). maybe we should look into setting up a patrol for february 25? My prediction: This community will ensure these two restaurants have the best week ever, by intentionally choosing to patronize them, and supporting them in the future. Please help Brick Road Pizza and Electric Cheetah pay for the cleanup costs by making them your lunch/dinner destination this week! "I dont know what their aim or goal is," Talbert said of the vandalism, "but I think they are a little misdirected. I think they are confused about what we are trying to accomplish here and what we have already accomplished. I wish we could sit down and talk to them about what they are trying to accomplish, and discuss our issues face to face." i think the hope is that if the people spray-painting their message about gentrification truly are concerned about it, that they would talk with the neighborhood leaders so that everyone can work together to put measures in place to ensure that the low income folks in the neighborhood aren't pushed out but instead welcomed. yes, it might be naive. but it really is the adult response, isn't it? if you have a problem, you work it out-not just throw a tantrum. Except you're not dealing with responsible adults here. These people are criminals. I could be wrong, but my guess is that gentrification is just a red herring, and that the perpetrators just want to cause havoc and are using gentrification as a convenient excuse. The development on Wealthy Street can hardly be considered gentrification. this is just angering to me. i wish people would read into things more before they decide to "throw the brick." Perhaps I'm being naive, but with threats of vandalism to come, is it completely out of the question to install hidden surveillance cameras along the Wealthy corridor? This seems like a plausible deterrent at a minimal investment. I know, no one likes the idea of surveilance (as seen in London) but several streets and intersections are already monitored. This is common practice in many cities. I am hardly a fan of surveillance but rumor has it that the camera outside the Huntington Bank at Fuller can see all the way down to Diamond. Not sure if that has been checked? I am saddened by these misplaced acts of aggression taking place in our city. I hope that Wealthy St and Grand Rapids continue to grow and succeed at the rate we have seen over the last few years. I have lived in and around Grand Rapids my whole life and I can't remember a more vibrant community than that which is flourishing right now. I think it is in our collective best interest to see that the businesses on Wealthy St continue to succeed in spite of the recent and any future acts of vandalism. They need cameras at this point for sure, this is so awful. Is the signature on the brick a circle-A or an A-hole? It's not about the Dutch, Black Americans, or new hipsters - Bring back the wolves! Who's right is it to say who should live somewhere? Why was one generation's occupation of this land better than another's? I wish people could play nice, especially when it comes to our local independent businesses. There are plenty of bigger enemies out there. Subjects seen at Walmart buying supplies for long lasting fashionable Mohawks. I like the extra support idea from Erin. Best way to stop these kids is also to let them know you refuse to leave. One of the results of this vandalism is that it will contribute to rising insurance premiums (both auto, home and renter's) for all residents of the area by contributing to the overall total of property crime in the area. So in effect, the people chucking bricks through windows are actually accelerating the gentrification process by driving up the cost of living for the people they're attempting to advocate for. They're probably in 7-10th grade and they'll tell their buddies and get caught. We're talking about brick throwers here. We'll look at their mug shots and think, "They spelled reclaim correctly?" This is a level of douchebaggery that screams idiot kids. Someone do me a favor and post their parent's TV interview, it should be a treat. The fact that they targeted places like Brick Road and Sparrows makes me think these guys really just have no clue. Are they really going to drive out two of the best non-chain local businesses in GR? Would they prefer a Biggby and a Dominos? 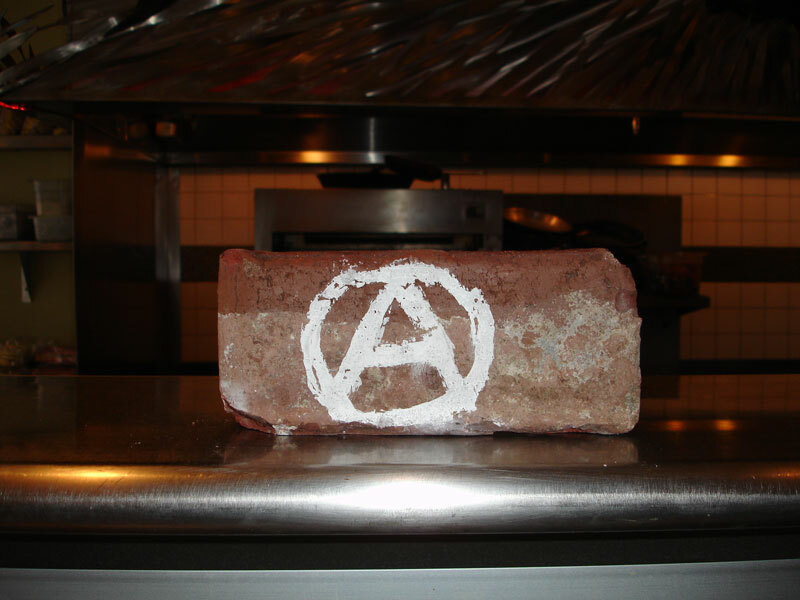 The anarchy symbol on the brick pretty much screams clueless crust-punk. It's pretty much become shorthand for "I'm a wannabe rebel who doesn't really know anything about actual oppression, but I like to break stuff and pretend".